Digital marketers tend to focus their efforts pretty early on in the funnel. This might be a mistake. At the bottom of the funnel, shoppers have already indicated their intent, which makes this fertile ground for optimization. For a variety of reasons, we tend to spend a disproportionate amount of time on running A/B tests for things like email captures, open rates, social shares, and time-on-page. All of these things are “micro-conversions” that usually correlate to the final purchase, but if you’re not optimizing for conversions late in the funnel, you’re leaving money on the table. Furthermore, it’s not actually much more difficult, tactically, to optimize near the bottom of the funnel. It’s just different. Before we get into specific tactics for bottom of the funnel optimization, let’s go over why it’s so important to do so. Every macro-conversion (i.e. whatever your most important metrics are - purchases, sign ups, etc.) is made up of a series of micro-conversions. That’s just the way user behavior works. A series of clicks eventually forms a path that leads to the big conversion. 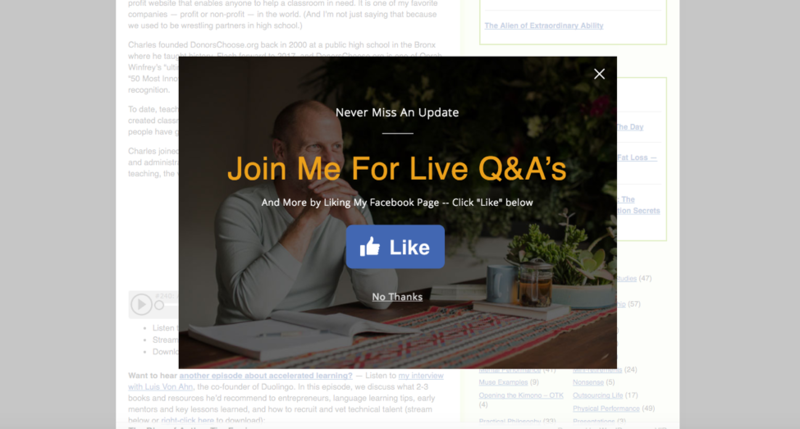 The way you’d figure out what your meaningful micro-conversions are requires the inquisitive work of a good analyst; you’re essentially looking for actions that correlate strongly with future purchases (here’s a good introductory article on how to do that). I’m of the belief (and it is a contested belief, don’t get me wrong) that optimizing for micro-conversions isn’t the best idea. Sure, you should track them and it’s absolutely important to know which events correlate with purchases and other desirable behavior. But if your main KPI in an A/B test or in personalization is something that doesn’t tie to the most important metrics - revenue, purchases, etc. - you’re opening yourself up to bias, data cherry-picking, and low quality decision making. No business was built on the back of higher time-on-site or email open rates. But, when we start to look towards the bottom of the funnel for optimization opportunities...well, that’s where the money is. This is really the bare minimum when it comes to personalization. It’s super easy to do, and if it increases open rates, sure, do it. But if this is as far as you think about personalization, then it’s a limiting view as to what can actually be accomplished. Again, that’s not to say something like this is ineffective. Exit-intent popups almost always increase the value of your traffic by capturing the emails of visitors that otherwise would have bounces. It’s just a limited view of personalization’s potential. These surely increase signups in a meaningful way. By no means should you ignore the top of the funnel. Email addresses are important, even more so when they’re segmented and you can push leads through the funnel in a strategic way. Point is, don’t ignore conversions later in the funnel. As Peep Laja put it, this is where the money is at. Think about it, random strikers leave the site before ever entering the checkout funnel, while motivated buyers come here to finish their order. Any small increase in this step usually has a direct impact on how much more money your site makes. So how can we, using data and real time personalization, increase conversions later in the funnel? Real time personalization software solutions like Granify makes it easy to do, but it’s still helpful to see some examples of companies doing it in a unique or creative way. What follows are some examples that should give you some inspiration. First note that the tactics here aren’t the most important part; it’s the thought process. How can you personalize your user experience to overcome objections in real-time, not just at the top of the funnel, but near purchase as well? In this first example, we have The Home. 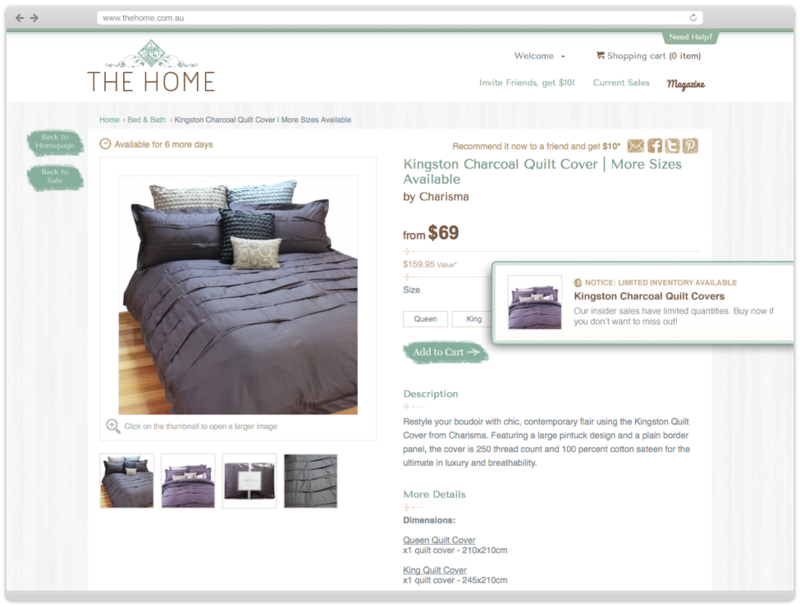 Using machine learning and a variety of behavioral data points, we’re able to predict the objections the user is dealing with on the product page. This results in the following creative, which emphasizes the scarcity of this offer. When you’re in the market for furniture (or anything), it’s easy to hesitate and procrastinate on your purchase. Certain behavioral data correlates with this propensity strongly, and therefore, predicting this hesitation can increase purchase rates and revenue. Money in the pocket. Another cool example from The Home, also on the product page, is an appeal to scarcity but in the form of limited inventory. 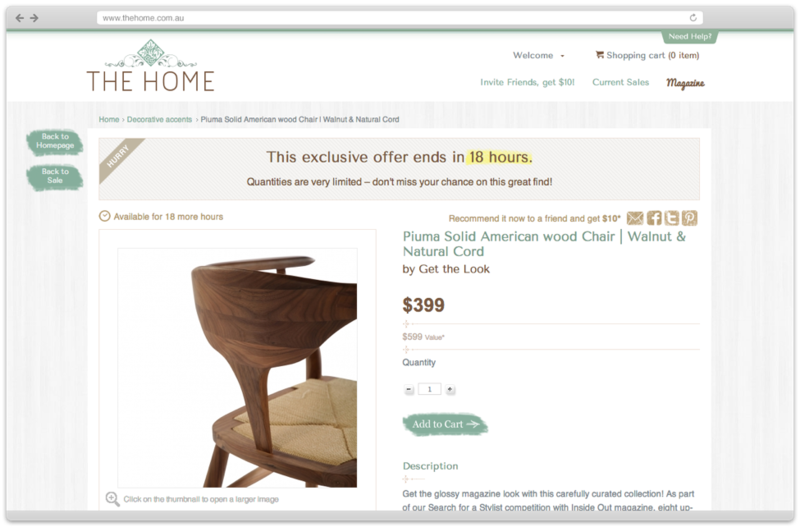 This, to a customer with high intent, might be even scarier than a limited time discount that might disappear soon. Booked 51 times in the last day! I’m not sure if this is personalization or just a static experience they’re running, but it’s quite effective. 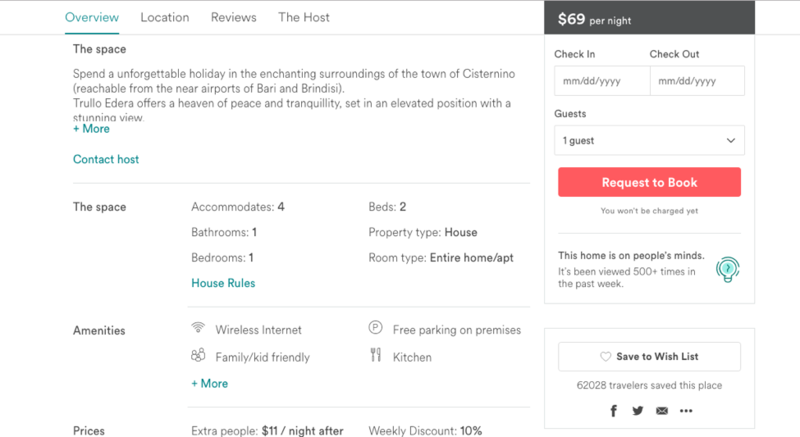 Airbnb is another company that is really good at this type of late funnel optimization. 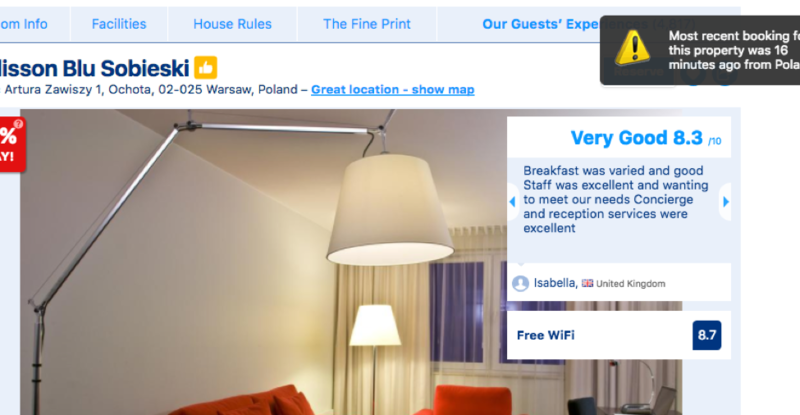 They tend to rely on social proof, listing how many times the page has been viewed recently and how many times travelers save a home to their wishlist. Finally, you may or may not consider reviews an “optimization tactic” but, used correctly, I think they qualify. 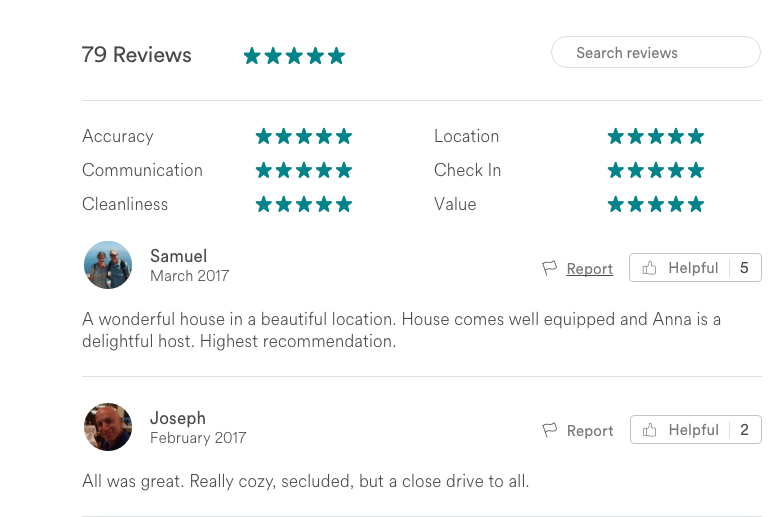 I’ve never booked a place on Airbnb without first consulting the reviews section. The more, the better; and of course, the higher the quality the better, too. Of course, it takes more effort than some HTML and CSS changes to collect quality reviews and display them in a compelling way. But there’s no denying that it’s this feature that pushes a significant percentage of visitors into converting. 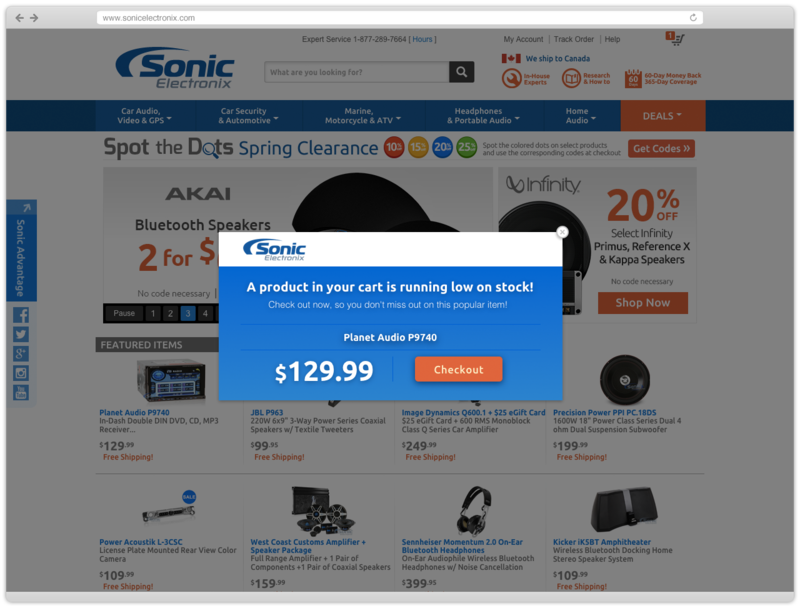 Another great example of late funnel personalization comes from Sonic Electronix. How easy is it to forget that you’ve placed something in your cart? I do it all the time. Now, most of the time, you just see a tiny quantity icon in your cart that indicates how many items are there. Even on Amazon, it’s happened more than once where I really wanted to purchase a book, so I added it to my cart only to forget it was there. Then later, when I finally remembered I wanted to buy it, it’s no longer in stock. Sad story, for sure. If you’re investing in site optimization and personalization, congratulations - you’re ahead a large portion of e-commerce teams. It’s still not well understood as traffic acquisition via SEO and PPC are so people aren’t investing as much as would be optimal. But if you’re stuck on top of funnel metrics and micro-conversions, try looking deeper in the funnel. 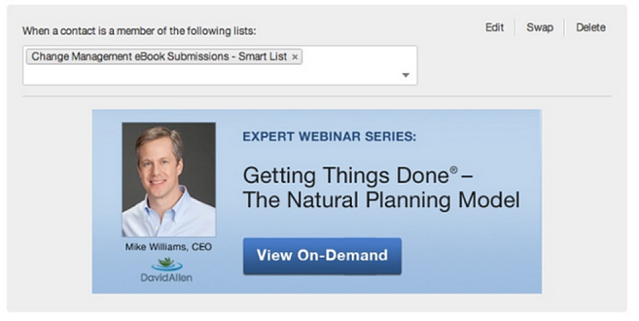 How can you nudge would-be buyers to convert once they’ve added items to the cart? How can you overcome objections when intent is at its highest? Every little percentage at the bottom of the funnel counts so much more because it’s real revenue, money in the pocket. Micro-actions are wonderful, but focusing on the area closest to the money is vastly rewarding and meaningful to the business.